To ward off nasty issues such as inflamed gums or fungal infections -- not to mention keeping your breath nice and fresh -- proper denture care is key. A typical denture care regimen involves brushing, soaking and brushing again. Denture cleaners -- which usually come in the form of effervescent dissolving tablets -- kill bacteria, remove stains and help dentures retain their pliable qualities. To do so, they rely on numerous active ingredients. Also known as baking soda, sodium bicarbonate typically serves as the active ingredient in off-the-shelf denture cleansers, including store-brand products and those from prominent manufacturers such as Polident. This white powder lends dissolving denture cleansers their fizzing quality and cleans dentures by alkalizing the water. Sodium bicarbonate, according to GoodGuide.com, is a safe and nontoxic ingredient. Often found in a 0.05-to-2-percent concentration, sodium hypochlorite -- commonly known as bleach -- also lends itself to some denture cleansers. This chemical compound primarily works as a disinfectant, though it has whitening and stain-removing properties as well. Although sodium hypochlorite sometimes appears in drinking water, the British Dental Health Foundation and the American Dental Association warn denture-wearers against using products that contain bleach, as it may weaken and discolor your dentures. Nonetheless, manufacturers such as Cepacol, Corega and Polident manufacture cleansers with this ingredient. The astringent citric acid also commonly appears in denture cleaners, as do fragrances, colors and flavors, such as peppermint, spearmint or menthol oils. In addition to a combination of cleaning and bleaching agents, denture cleaners usually contain enzymes, detergents and surfactants, the latter of which helps reduce surface tension in dissolved liquids. 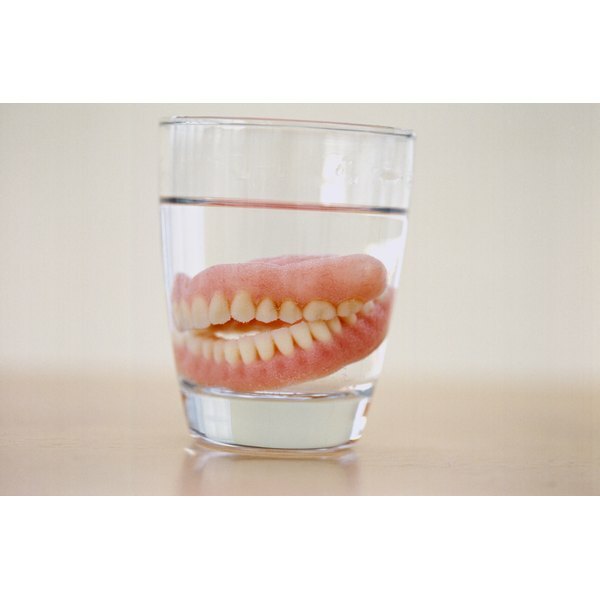 Dentist Dr. Mark Burhenne recommends avoiding denture cleansers with persulfate, which may cause allergic reactions that lead to tissue damage, irritation, blood pressure issues or breathing problems. As an alternative to chemical-based cleaners, Dr. Burhenne suggests soaking your dentures in a simple solution of water and a few squirts of olive-oil-based castile soap. Be sure to first give your dentures a light brushing with an electric toothbrush and a bit of toothpaste, as needed. At the drugstore, seek denture products with the American Dental Association seal, which indicates the presence of efficacy-proving studies and safe ingredients. Check with your dentist before soaking dentures with soft liners or metal components in any sort of cleanser.